Find out more about the Lorex 2K Weatherproof IP PTZ Camera with features, pricing, and frequently asked questions. 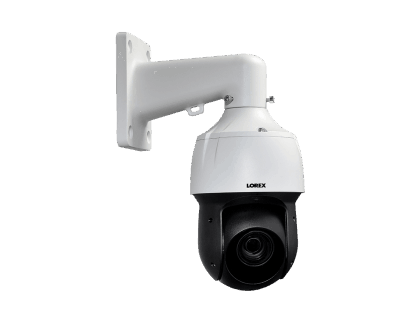 The Lorex 2K Weatherproof IP PTZ Camera is an indoor/outdoor security camera made by Lorex. The camera has a 12x optical zoom lens for close viewing. 12x optical zoom with 16x digital zoom. Pros: Weatherproof exterior. 12x optical zoom for detailed viewing. Remote connectivity. Cons: Must be permanently mounted to a wall. Bottomline: The Lorex 2K Weatherproof IP PTZ Camera is loaded with features that will enhance security on any property. What are some alternatives to the Lorex 2K Weatherproof IP PTZ Camera? Where can I buy the Lorex 2K Weatherproof IP PTZ Camera? You can buy the Lorex 2K Weatherproof IP PTZ Camera on Amazon or the Lorex website. Does the Lorex 2K Weatherproof IP PTZ Camera work at night? The Lorex 2K Weatherproof IP PTZ Camera can see up to 330 ft. in total darkness. Can the Lorex 2K Weatherproof IP PTZ Camera be used in any weather? Yes, the camera is weatherproof and can be used in temperatures ranging from -40°C to 70°C.